Domokun Sandwich Bento, a photo by sherimiya ♥ on Flickr. RAWR! It's Domo today! I recently realized I hadn't made a Domokun charaben in a long time. Here's another Domo sandwich I made. And another one. (Seems I only made him on field trips! How funny.) And why not? He's so cute. I made a tiny cream cheese sandwich using rye cocktail bread, which is square-shaped and comes in a long loaf. His eyes are bits of grapes, his mouth is a red plum, and his teeth are cut from mozzarella. This was a snack bento for TinySprite, so she got a few little cups of fruit: peach, nectarine and raspberries, along with cherries and grapes. I also squeezed a few peapods, carved carrots and tiny broccoli florets next to him. He looks like he wants a hug, doesn't he? Added to What's For Lunch! Too cute! I was going to make croquettes for Domo-kun...but this is a much better idea! My 13 year old LOVES Domo! In fact I am staring at drawing he made of Domo that is in my computer cabinet. He will LOVE this, so I definitely have to make one when school starts. TOO CUTE! Bento is so yummy and being in high school lunch has to be pretty easy to make but super yummy too :) Thanks!!! LOL!!! So cute! Domokun just made me smile... =) You made anpanman too (I see the picture below). You are really genius! I bet my kids will want to live at your house now. Hehee. I'll give him a hug!!! Your bentos always make me smile Sheri! That sounds like a useful and practical product Deb. Thanks for sharing. That's so sweet melonpan! Thanks! 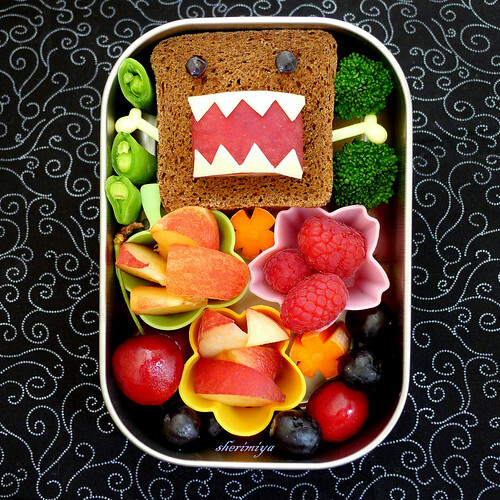 I can't help it but to grin as big as Domo the moment I see this bento!! Love it! Aw, you're so sweet Xelia. Thanks a lot!! I love this bento, my kiddo wants one now! Too cute and I like all the colors and shapes you used. Check out my site hope you like it too! Heehee, Domo is awesome!!! Beautiful bento Sheri! Haha! Thanks Big Momma and Susan!! hi! first timer here. your bentos are so cute! i'll have to start making bentos for my five year old next wk as she starts kinder. do you recommend making bento the night before or morning of? i have a four month old so i don't know how much time i'll have in the morning...your advice would be helpful. thank you! Hi, and thanks! I'm not really a morning person, and everything is usually so hectic that I prefer to get most of it done the night before. The only ones that I prepare in the morning are the thermal bento, that I heat up and pack into a food jar. But even when I do that, I still pack the side box with fruit and veggies the night before. Whatever I can do ahead of time, I always do! It can be done. Good luck and have fun!